X-Treme Duty One Piece Steel Base | Riflescopes & Sport Optics | Nightforce Optics, Inc.
An integral recoil lug machined on the bottom of the base (Rem 700 and HS700) provides a precise fit when bedded to rifle actions, preventing any movement of the base or recoil stress on screws holding the base to the receiver.Our one-piece bases are machined to exact Mil. Std. 1913 specification rail dimensions. This design allows the same scope to be used on several different rifles, always optimizing eye relief. A 20 Minute of Angle (MOA) taper is standard, with a 40 MOA taper offered for Remington 700 bases. 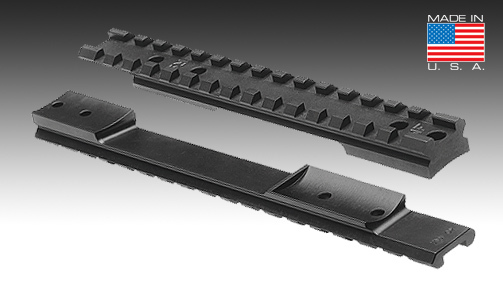 Designed for right-or left-hand actions, our bases will never interfere with loading or extraction.